Rinpoche will teach at the Kopan November course, and will then visit Bangalore on December 2nd (yes, the date has changed) for the public talk currently scheduled to be given by His Holiness the Dalai Lama at the request of Choe Khor Sum Ling Study Group (the group which His Holiness asked Rinpoche to start). It begins in Taiwan on February 12 and 13 with the Great Chenrezig initiation at Shakyamuni Center, Taichung. Which will be followed by Rinpoche leading retreat on the long Dharani of Chenrezig between Feb 14 – March 4th – this will be the main long retreat students can join Rinpoche on in 2005. From Taiwan, Rinpoche will go to Malaysia, first to Losang Dragpa Center for teachings on the 8 Verses of Thought Transformation, April 2 and 3. Then retreat on the 3 Principles of the Path at Jangsem Ling, April 8 – 11. Next stop will be Amitabha Buddhist Centre, Singapore – April 23 & 24 teachings on the 3 Principles of the Path, April 30 – May 1st Rinpoche will give the Great Chenrezig initiation, and on May 7 & 8 the Cittamani Tara initiation. Rinpoche is likely to also give a Highest Yoga Tantra initiation in both Singapore and Malaysia. The next scheduled teachings are in Spain, August 19 – 21 at Nagarjuna Madrid, and then August 26-28 at Osel Ling. 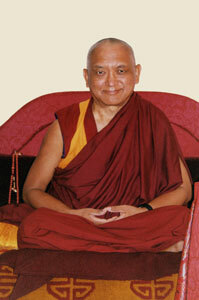 Centers often request Rinpoche to check about which pujas to do to overcome obstacles and create the causes for success. Ven Roger Kunsang’s suggestion is to contribute to the pujas that Rinpoche initiates every year on every special day of the Buddha at the main monasteries. These are pujas which Rinpoche has checked very carefully to determine which will be of most benefit for the FPMT at that time, and there are literally thousands of monks doing prayers for our centers and for all Rinpoche’s projects. So this is excellent for the center to contribute to. The center can just contribute whatever feels comfortable and it will go a long way to supporting pujas and prayers in many monasteries by thousands of monks. If you decide to contribute in this way, all center students should know about it, and consciously rejoice very strongly and make powerful dedications of the merit for the center, and so on. (See below for more about special dedication prayers). Lama Zopa Rinpoche recently dictated a collection of specific dedication prayers that individuals and centers can use when engaging in virtuous activities especially for FPMT-related projects. So, to make special dedications to fulfill Rinpoche’s wishes for FPMT, do get a copy of ‘Dedication Prayers for Special Occasions’ to add to the usual dedication prayers – and of course, please always include the long or the short version of the long life prayer for Lama Zopa Rinpoche! ‘Why is it so important to learn about Buddhism and to practice it? Because what we are all seeking is happiness and what none of us want is suffering. Therefore we need to abandon the real cause of suffering and create the unmistaken cause of happiness. The actual cause of happiness is not outside. Even though people commonly believe that suffering is connected to external situations, actually these are just the conditions for suffering. Similarly, the actual cause of happiness is not outside, it is within the mind. If there were loving kindness, compassion, the thought of benefiting others and contentment in the hearts of everyone in the world, there would be no need for weapons or guns at all, and no reason to have armies. How incredible this country and the world would be if everyone could generate and develop these most precious qualities of the mind! With these inner qualities, you become a friend to everyone and everyone becomes your friend. You love everyone and everyone loves you. How incredibly happy the world would be! Who is Buddha and How is Buddha Guiding Me? I live in New York City and am 9 years old. I have been vegetarian all my life. I was very very happy, very happy to receive your email that you had saved so many flies and spent your afternoon liberating these flies. I want to thank you very much for practicing my advice, liberating these living beings. Here is some more explanation about the benefits of helping living beings like this, please see if you can understand this advice and also help other boys and girls to understand how important it is to help others, especially to help the animals and all the different creatures in the world to protect their lives. I am going to put your picture in the Mandala and explain what you did, I am very happy.